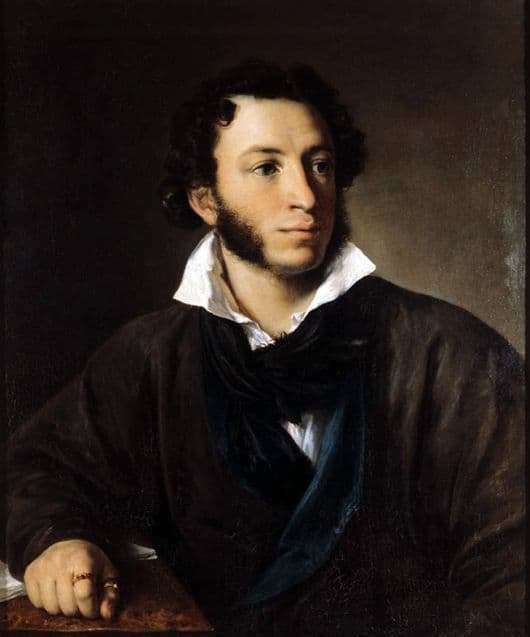 The portrait of Alexander Sergeevich Pushkin, created by artist Vasily Tropinin, is perhaps the most popular depiction of the great poet at the present time. And according to Alexander Sergeyevich himself – this portrait is rather realistic. Before us is the figure of the poet, he sits, slightly turning his head, his gaze forms a diagonal relative to us from the depth of the left side of the portrait to the outside of the canvas to the right. The poet shaves smoothly, with the exception of soft whiskers, which remind us of light clouds, with the only difference that they are black, like curly hair on the head of a classic. The white shirt’s collar is starched with a stake and tied with a black scarf. Above the underwear, the poet is dressed in a robe that reminds us of something between a coat and a brown dressing gown with black cuffs. In the lower left corner of the picture there is a red-pink, possibly from granite, the table on which rests the hand of the great classic of the golden word. Fingers clenched into a relaxed fist. On the index and thumb, we see the gold rings adorning the hand of the unsurpassed master of the pen. If you look a little closer, you can find a manuscript hidden from us under the elbow of Pushkin’s hand, whose white corners only slightly show themselves to the observant connoisseur of art. The portrait is very elegant. Alexander Sergeevich is depicted here with the maximum degree of certainty, as if we are a living person or his photograph. The poet’s gaze and face are calm and at the same time there is a bit of anxiety or concern about something to come. Perhaps the poet was contemplating his future, at least the hidden fear in this picture is present, however, the overall impression of the picture is aesthetically positive.